PHILADELPHIA, PA —South Street has long been Philadelphia’s Brooklyn. Even before Brooklyn became the Northeast’s hipster magnet, South Street was Philly's contribution to cool. Indy movies and music stores, art studios and souvlaki shops. But South Street barely survived the 60s. 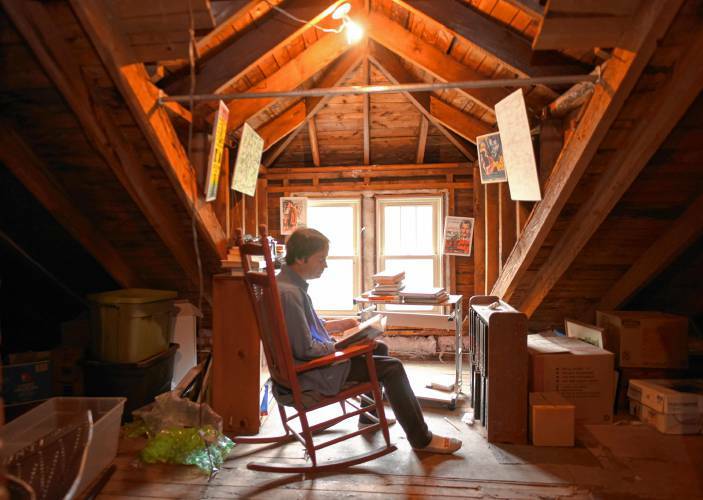 When Isaiah Zagar finished the Peace Corps in Peru, he was looking for a place to be an artist. It was 1968 and America’s cities were decaying, burning. Much of South Street was slated for demolition, making way for a crosstown expressway. But Zagar, born and raised in Philadelphia, had seen folk art revive communities in Peru, so he hunkered down on South Street and got busy — cutting tiles, mortaring, dreaming. Zagar and his wife, Julia, opened Eyes Gallery at 402 South Street. Just down the block, other artists opened the Painted Bride Art Center. And The Works Gallery. And more. Artists came, as did art lovers. The crosstown expressway was never built. The South Street Renaissance rolled on. Today, South Street is yet another island in the sovereign nation of Bohemia. And along with tattoo parlors and vape shops, its hosts a dozen glittering mosaics that fill entire walls, all done by Isaiah Zagar. But at 1020 South Street, the mosaics don’t just stretch to the sky. They descend into the earth, rise in staircases, spill to the sidewalk. Philadelphia’s Magic Gardens are more than folk art. -- they are an art history lesson, and a tribute to what art can do if you let it. “REMEMBER WALKING AROUND IN THIS PIECE OF FICTION,” reads a tiled message on one wall. But I assure you — you won’t forget. A walk through the magic gardens is amusing and astonishing. Here in one corner is a Van Gogh-ish swirl of multi-colored tiles. There on an opposite wall stands a gallery of small terracotta heads. Across a sunken grotto looms a statuesque pile of junk — bicycle wheels, bottles, bric-a-brac. Look up and the sky is silhouetted by sculpture. Look down and your path is paved by more mosaics, every tile hand cut and planted with care. Zagar, who studied art at Brooklyn’s Pratt Institute, pays tribute to his idols here. Names spelled out in tile include those of abstract impressionist Barnett Newman, pop artist Jasper Johns, and Simon Rodia, creator of the Watts Towers in L.A. To those who love Rodia’s towers, the Magic Gardens can seem like a horizontal version of his soaring vision, but they owe a greater debt to a forgotten artist. When Zagar was 18, he journeyed to Woodstock, New York. There, before the quirky town lent its name to the rock festival, lived a slightly mad artist named Clarence Schmidt. 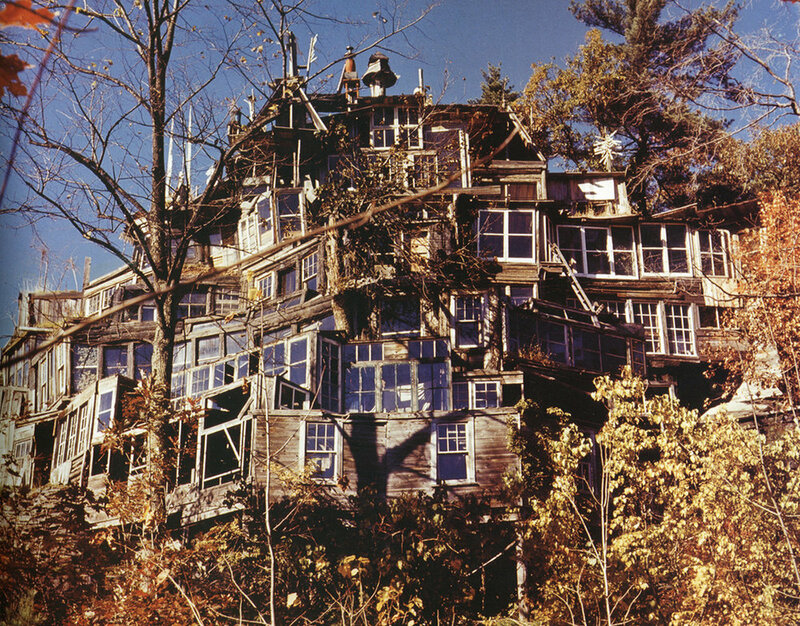 Schmidt spent forty years building “Miracle of the Mountain,” a seven-story patchwork pyramid of shrines, gardens, pools, and playthings. The “Miracle” was little known beyond Woodstock but it made an impression on a young artist. Alas, folk art has always struggled for acceptance in America. Everyone knows some crackpot with a junkpile he calls art, so what is genuine folk art? Rodia’s Watts Towers were almost torn down. Schmidt’s “Miracle of the Mountain” burned to the ground. And Zagar’s gardens nearly met their own destruction. Zagar began the gardens in 1994. For eight years, he mortared and tiled, built and imagined. Then his landlord dropped by. By 2002, South Street was not just cool but commercially “hot,” and the landlord was about to sell the lot. South Street would have none of it. Locals rallied to raise funds, helping Zagar own his 3,000 square foot mosaic miracle. Saved from destruction, the gardens opened to the public in 2008. They now draw 100,000 visitors a year. During my visit, I heard Russian and Italian, Spanish and French. Philadelphia’s Magic Gardens are only the starting point for the city’s street art. Since 1985, the Mural Arts Project, begun as a battle against graffiti, has painted some of America’s most dazzling murals. (Click on the right side below to see a few.) More than 2,000 murals now grace the city, making Philadelphia the world’s largest outdoor art gallery. Philadelphia could use a crosstown expressway. Getting from east to west here is a huge pain. But thanks to Isaiah Zagar and many muralists, the crosstown journey is not beautiful, but it's art.